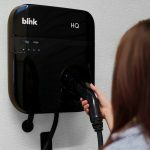 Blink HQ, a new family of EV charging products for the home, gives you complete range confidence. Only Blink HQ provides a full charge every morning and the connection to Blink Network’s over 4,000 public chargers. Not only can you charge up to four times faster than the standard charging cord, Blink HQ offers an affordable answer to complete range confidence and is the only charger that comes with a $100 bonus credit (expires 6 months after purchase) on Blink’s broad-based public charging network. The Blink HQ isn’t just the most attractively priced Level 2 home charging solution, it’s also convenient, compact and simple to use. With a built-in timer delay, Blink HQ can be set to charge at your convenience allowing you to save money by charging overnight when utility rates may be lower. The sleek front panel LED indicator displays your vehicle’s charging status while a generous 18-foot cable offers flexible installation options. With a compact and sleek design and an included bracket for the cable, Blink HQ’s small footprint translates to invaluable wall space in the garage. A $100 bonus credit (expires 6 months after purchase) gives you immediate membership access to our rapidly growing Blink Network of over 4,000 public charging stations. When you purchase the Blink HQ you can stay connected and charged at home and when you’re out on the road. Order today to get the most out of your EV’s range. Experience freedom, confidence and connection with Blink HQ.